Join us for a multi-media, ecology-based art happening with Lisa Schonberg and the Portland, Oregon percussion ensemble Secret Drum Band. Secret Drum Band co-director and founder Lisa Schonberg is a composer, percussionist, field recordist, writer, naturalist, environmental artist, and teacher. She earned her Masters in Environmental Studies at the Evergreen State College with a focus on ant biodiversity in the Neotropics. Schonberg uses music and writing to document soundscapes, insects, and habitat, with the goal of drawing attention to endangered species, habitat loss, and other environmental issues. She works in the intersection of ecology and art, and is driven to create opportunities for collaboration between these fields. Schonberg’s place-based compositions are performed by her percussion and noise ensemble Secret Drum Band. Secret Drum Band’s debut album, Dynamics sees Schonberg and co-composer Allan Wilson delving headway into creating living, breathing soundscapes, rich in rhythmic textures. 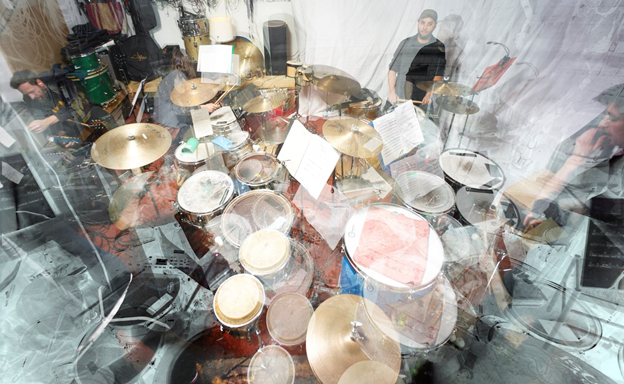 Driven by five drummers, each song also employs an array of affected vocals, guitar, and synthesizers from noise musicians. Secret Drum Band's tour performances will feature new works based on soundscapes and ant acoustics in the Brazilian Amazon, research on the endangered Hylaeus bees and their habitats in Hawaii, and field recordings from Schonberg's time as an artist-in-residence at HJ Andrews Biological Station in Oregon. Learn more about Lisa’s work at her website. Tune in to the Off the Couch show on WRFI (88.1 FM Ithaca, 91.9 FM Watkins Glen) Friday March 22, 5 p.m. for an interview with Lisa.